It is inevitable that you will want to write the degree symbol to your 16×2 character LCD once you have it wired to the Pi. My son wired it up, and then wanted to display the degree symbol. 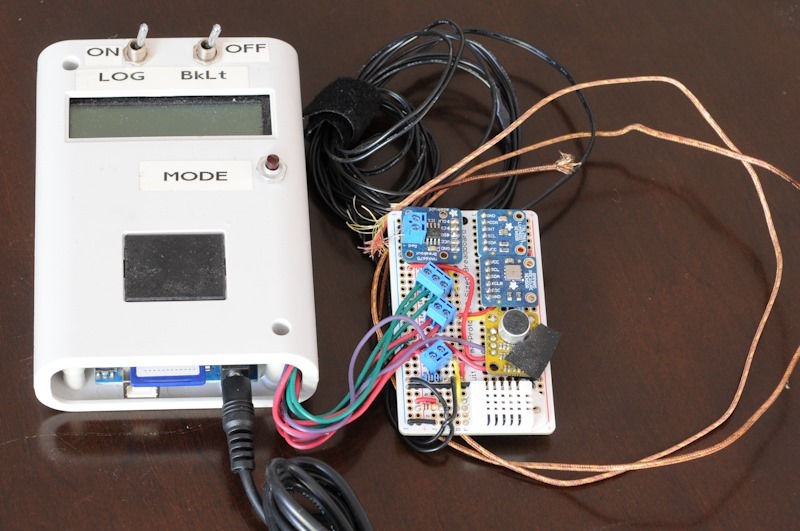 In the past I have solved that problem for the Arduino using the Adafruit character LCD Arduino library createChar() function. Relatively painless for the Arduino. 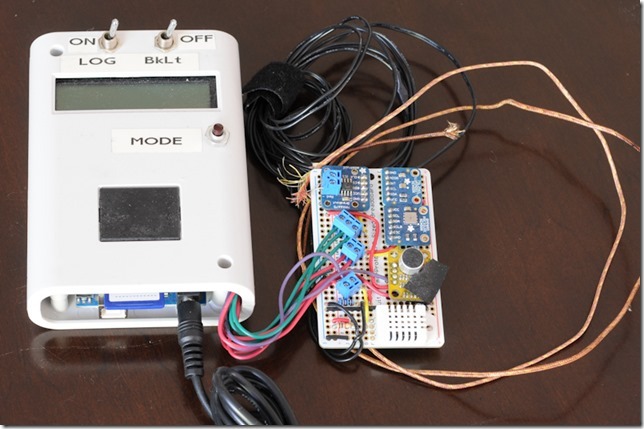 Unfortunately, the Adafruit LCD library for GPIO not using i2c does not have an equivalent of the createChar() function. Sad. The solution turns out to be easy. You rely on the fact that the LCD already has a degree symbol built in, and then use the write4bits() function to display it. There are other characters available, I found mine here. Here is our code. temp_f = 32. + temp_c*9./5. 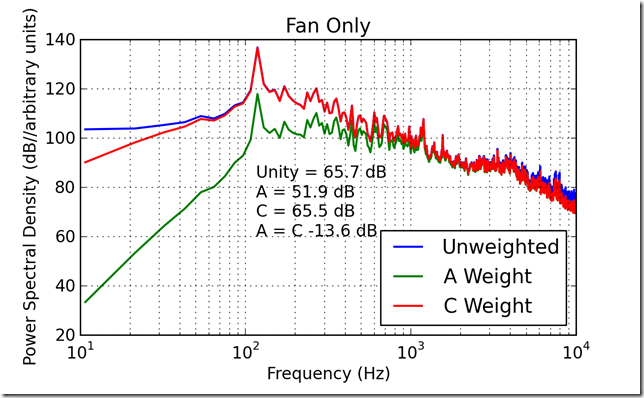 I am working with the freetronics microphone module, which is described as having a sensitivity of “-40 dB typical”—let us assume it is dB (SPL) referenced to 20 micropascals root mean square (rms) at 1 KHz. When I think of an electronic element’s sensitivity, though, I’m thinking volts per micropascal and this is not provided. 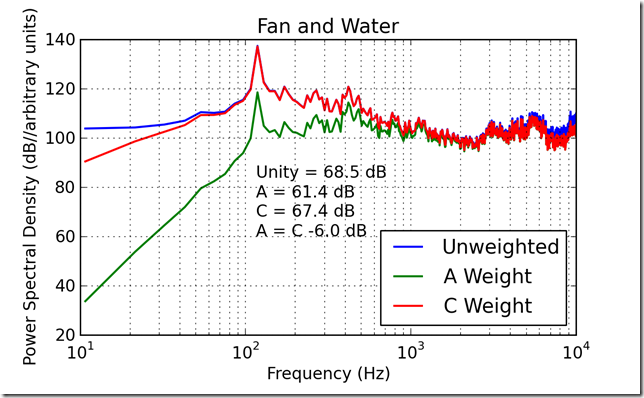 The microphone’s schematic suggests the SPL measurement is the rms average over 3 milliseconds, and that the signal is proportional to rms pressure level. This suggests a log scale for display (a change from previous work). 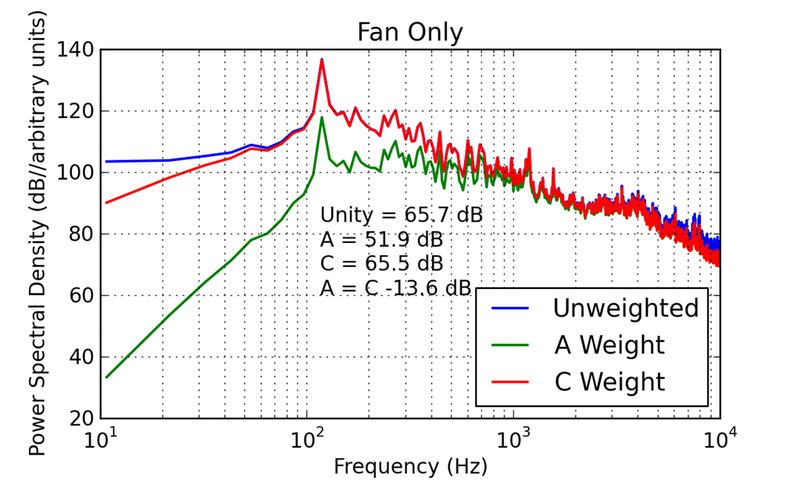 The upshot is that the fan generates about 62 dBA; but to get that conclusion, I had to perform a spectral correction to match measurements from a more calibrated sensor. 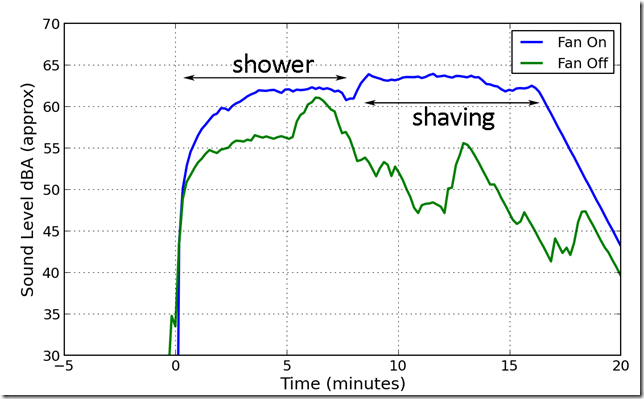 Remember that I made the measurements with the RIMU data logger I built. That data logger has a digital low-pass filter on the microphone SPL. The low-pass filter has much too slow a response, but the basic result is OK. The RIMU, shown in the next picture, is the instrument. I borrowed an SPL meter from my father (thanks!). It is, unfortunately, a C-weighted measurement, measuring in dBC. 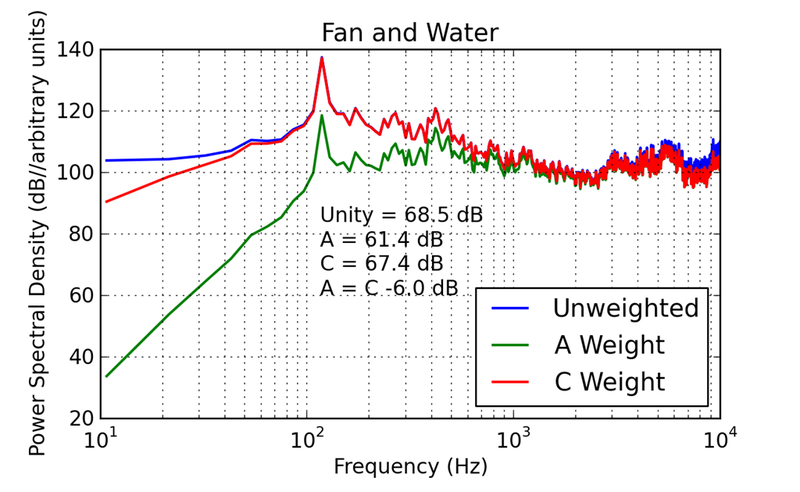 The C-weighting is occasionally a very useful measurement of sound level. Most measurements are done A-weighted, which is similar to human hearing. My challenge is to convert a measurement made with an unweighted microphone in arbitrary units to A-weighted measurement in dBA. The answer is to take a measurement with the instrument in dBC, and record the sound a with a sound recorder, figure out what converts C-weighting to A-weighting for this signal. 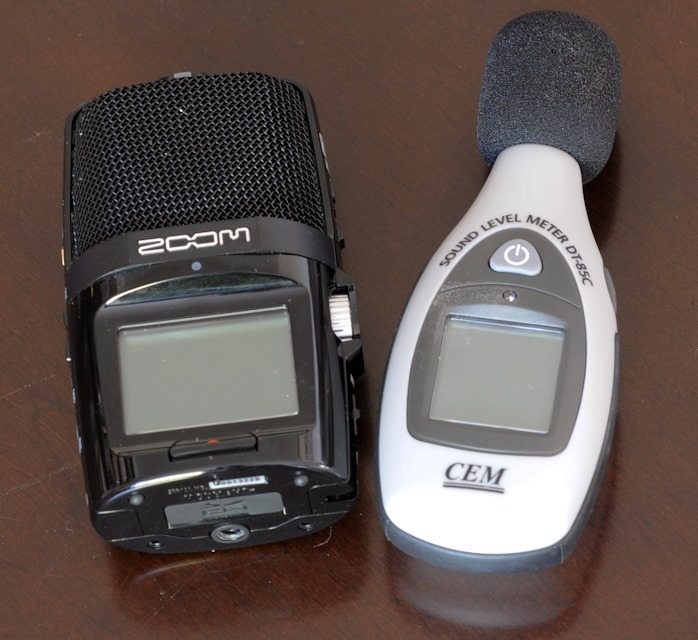 In the spectra below you can see that the spectrum recorded without weighting, by the Zoom recorder. I then applied an A weighting and a C weighting. What’s important is the conversion between the rms value for A and the rms value for C, which is a 6 dB correction in one case, and a 13 dB correction in the other. Apply the C-to-A correction to the RIMU measurement. Pretty epic pain, but at least I have the measurements. In the future I will recode the RIMU to take short A-weighted and C-weighted snapshots, and then calibrate the RIMU on the dBA record. Look for a follow-up post far in the future. 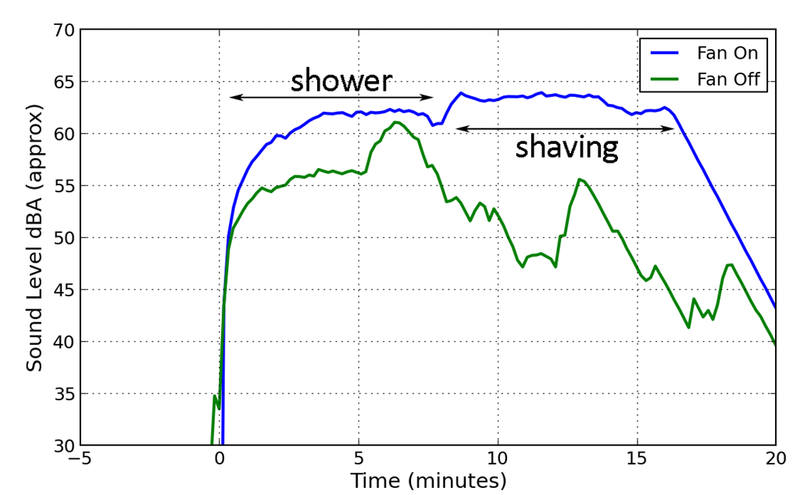 The Arduino Uno is not the ultimate signal processing machine, but it can do some light duty work on burst data. I had trouble finding the maximum sample rate the Uno can support, which is totally critical for most kinds of work. Pretty close to a 60 KHz sample rate, more than adequate for audio sampling. Of course, the Arduino doesn’t have enough memory to be a serious audio processor, but it is pretty goood. The forums discuss this, and arrive at a similar conclusion.